Zakia with her mushrooms. Photo by Michel Tannous / Preemptive Love Coalition. At 7-years-old, Zakia knew every inch of land around her home. She knew all the fields surrounding her Syrian village, where she roamed. Zakia knew where to find water, and where to find edible leaves, no matter the time of year. She had to know. By the age of seven, Zakia already had a lot of responsibility, working as a shepherd. It may look like Zakia never had much choice in life, but she always had a choice in how to respond to her circumstances. Zakia chose to embrace what came with love. For Zakia and her siblings–six sisters and four brothers—life wasn’t exactly rich in opportunity. Her siblings married early, to lessen the burden on their family. But Zakia was kept home, taking care of her stepmother and her flock. Her sheep became the most precious things in the world to her. For years Zakia’s life followed the familiar daily patterns of taking care of the housework, and the seasonal patterns of grazing her sheep, until one day she was married to a man twice her age. At 35-years-old, everything that had been familiar was flipped upside down. Zakia’s 70-year-old husband had been married more than once already. He had three children, all of whom needed care because of a variety of disabilities. His mother, still alive, lived with them and needed care. Then there were the sheep. And there was displacement because of the war, as if their lives weren’t difficult enough. That’s a lot of responsibility! Zakia knew what it was to live a life of serving. She knew what it was to pour herself into others. And so Zakia formed new daily patterns, of taking care of housework, looking after those in her new family, and of course the precious sheep. I don’t think anyone would have blamed Zakia for becoming bitter with life. But she didn’t. She loves her husband and his mother. She helped them all settle back into the village when it was finally liberated. She cared not only for their three sheep, but for those of other villagers too, taking the sheep out to pasture during the day, and returning at sunset. From the outside, it looks that Zakia never had much choice in life. In truth, she always had a choice in how to respond to her circumstances. Zakia chose to embrace what came with love. But Zakia rarely had the opportunity to carve out new opportunities for herself—that kind of life wasn’t for someone like her. Zakia heard about the chance to grow mushrooms through our pilot project. It was so different than anything else she had known—and she couldn’t pass up the chance to try! Zakia attended the training sessions and worked hard to learn everything she needed to know. She threw herself into the experience and asked tons of questions. When the time came to create a space in her home for growing mushrooms—a dedicated space that needed just the right conditions—Zakia threw herself into that, too. The team visited her home to make sure she had a suitable space, and Zakia started the next phase of her life, with sterile, straw-filled plastic bags hanging from wooden frames. Zakia isn’t a shepherd anymore—she’s a mushroom grower now. And her life perfectly illustrates the beauty of this project. 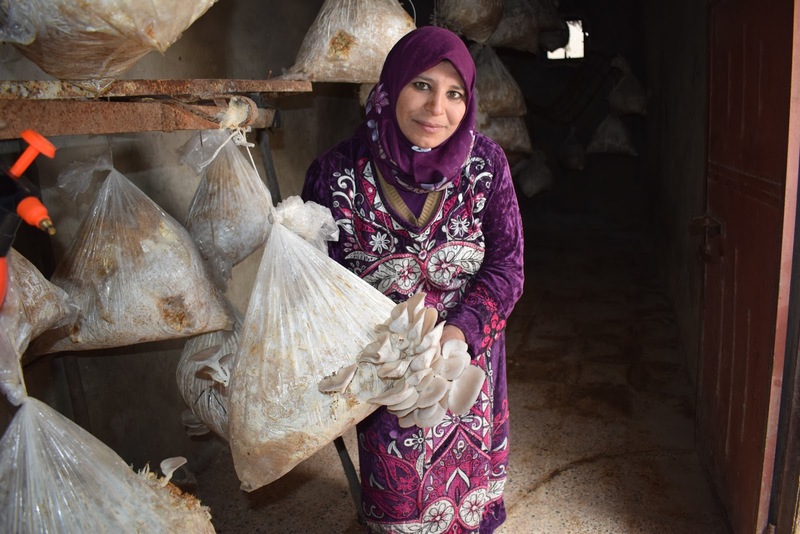 Through mushroom farming, Zakia gets to spend her time close to home. She’s able to care for her home and her family with her presence, as well as her efforts. If you donated toward agriculture projects in Syria, you changed lives like Zakia’s. You gave the opportunity to disrupt patterns in life established in childhood, then disrupted by war, and finally allowed the chance to carve out a new way. Right now there are wheat farmers returning home to their corner of Syria—their communities now liberated from war—hoping for their chance to rebuild their lives. You can change their lives just as you did Zakia’s. Help Syrian women create a new identity—and a new life. Give today.